According to reports, Nets forward Andray Blatche and two other men were taken into custody for questioning by Philadelphia police after an alleged sexual assault of a woman at the city's Four Seasons Hotel. GM Billy King said in a statement that the team is aware of "an ongoing police investigation regarding a member of the Brooklyn Nets," and said that the team will have no further comment until the investigation has concluded. He also said that all players were available for tonight's game against the Sixers. According to NBC Philadelphia, a 21-year old woman told police that she was sexually assaulted by someone in the hotel and was taken by ambulance to the hospital at around 4 a.m. this morning. Police told NBC Philadelphia that a Nets player was in the hotel suite but not in the bedroom where the alleged assault occurred. That report also said that the player, as well as a 41-year-old man and a 25-year-old man, were taken into custody for questioning. Via Ball Don't Lie, the following message was sent out from Blatche's Twitter account earlier today, though it appears that it's since been deleted: "Im ok and I didn't do anything jus was n the area when it happened." ESPN New York reports that no charges have been filed, but that the investigation is ongoing. Update: Says Philadelphia police commissioner Charles Ramsey, via Howard Beck of the Times: "From all accounts, he (Blatche) was not personally involved in any kind of assault or anything like that." 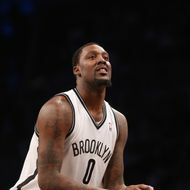 Beck reports that Blatche was questioned and released; he will not be charged.